The Fredericksburg National Cemetery contains the burials of 15,436 servicemen, women and dependents. Of that number 12,793, or 83%, are unidentified individuals. Each burial, each person, had a story. For those buried as unknown, we will likely never know their stories. For those fortunate enough to have been identified, we have over time come to know a few – their families, their fates. From time to time, while researching one topic we occasionally stumble upon information related to another. Recently, while digging into information related to a Union battery’s winter campsite, a few sources crossed and began to illuminate the story of one of its members who lies in the Fredericksburg National Cemetery. Edwin Morton Platts was a favorite within the 5th Independent Battery, Massachusetts Light Battery (also known as Battery E, Massachusetts Light Artillery). His was the only death suffered by the battery during the December 1862 Battle of Fredericksburg and the loss was felt deeply by the members of the battery. They wrote about Edwin, his death and his burial. He is buried in Grave #2742. The fact that his grave on the battlefield was located and that he lies beneath a stone that bears his name is due to the care of his comrades. This is his story. Edwin Morton Platts was born May 29, 1845 to John and Nancy Platts in Charlestown, Massachusetts. Nancy died during child birth two years later and in 1860 young Edwin worked as a “Store Boy” in Boston, living under the roof of Amos D. George, a salesman from New Hampshire. Edwin enlisted in the army on September 29, 1861 in Boston, at the age of 16, and agreed to serve three years. He was assigned to the 5th Independent Battery, Massachusetts Light Artillery. The cards in Edwin’s Compiled Service Record list him as 18-years old at the time of his enlistment, when in fact he was just four months past his 16th birthday. His service record also identifies him as “Edward” and not Edwin. Perhaps he boosted his age and provided a different name or perhaps it was simply a clerical error. Interestingly, his older brother John Franklin Platts served under the assumed name of Francis Poor in both the 4th Connecticut Infantry and the 1st Connecticut Heavy Artillery. Edwin served through the spring 1862 campaigns below Richmond, Va., as well as at the Second Battle of Manassas. Edwin entered his final battle at Fredericksburg a corporal, having been promoted from private the previous month. On the afternoon of December 13 the battery crossed the Rappahannock River by the middle pontoon bridge. Private William Waugh, Edwin’s tent mate, remembered many years later encountering his friend while waiting to cross the pontoon bridge. The two had enlisted on the same day and had become quite close. Waugh remembered that while they waited to cross the river Edwin approached him and said “Now we are going into a hot place, look out for yourself.” Waugh responded with similar words of caution. “We talked to-gether for a short time when the bugler blew ‘Attention,’” recollected Waugh. “He left me to take his place. That was the last time I ever talked with him.” The battery pushed through the lower end of town and unlimbered its guns between the town’s poor house and John L. Knight’s brick kiln. The position was near the head of modern-day Dunmore Street, behind Walker-Grant Center. Captain Charles A. Phillips used the terrain to his advantage. He placed his guns behind the grade of the Richmond, Fredericksburg and Potomac Railroad. An early 20th century depiction of supporting operations for the final Union assault at Fredericksburg, December 13, 1862. The scene here may very well depict Captain Charles A. Phillips’ 5th Battery Massachusetts Light Artillery in action. From: Walter F. Beyer and Oscar F. Keydel, eds., Deeds of Valor 1: 108. This post is the fourth and final in a series exploring the details of the death of German shopkeeper Charles Miller’s brother George after an exchange in Charles’ shop with four Union soldiers on their way home from war in May 1865. The previous posts can be found here: Part One, A Darkness on Commerce St.; Part 2, Suspects and Scapegoats; and Part 3, Doctor Galland Takes the Stand. Four soldiers of the Sixth Corps, Army of the Potomac, stood trial in late May and early June on charges of murdering a citizen of Fredericksburg. Beginning on June 1, 1865, a court martial convened to hear the case of Private William Irvin, Co. D, 67th Pennsylvania Volunteers and Private Amos Fielding, Co. E, 61st Pennsylvania Volunteers brought up on the charge that they did, “maliciously and unlawfully take the life of George Miller a Citizen of the City of Fredericksburg, Va.” Both pled not guilty. The next trial convened just two days later, charging Private James Lynch, Co. A, 61st Pennsylvania Volunteers that he did, “unlawfully and maliciously aid and abet in taking the life of George Miller.” A fourth soldier, Private John Wilson, 67th Pennsylvania Volunteers, was brought to both trials, but charges were not specified against him. A standout among the other witnesses, Doctor Galland, an African American camp servant and cook, offered pivotal testimony. His words refuted James Lynch’s testimony against John Wilson and identified Lynch as a suspicious individual along with the other men. The resulting verdict demonstrated that the courts gave validity to Galland’s testimony over Lynch’s—a remarkable decision in itself, to trust a black man’s word over a white man’s. Modern view of Charles Miller’s shop at 600 Commerce Street (William Street). The brothers exited the door to the left, walked past where today stands the “Do Not Enter” sign, and continued down Commerce Street toward the river in search of a provost guard. Brick-wielding Union soldiers attacked them halfway through the next block. George Miller was found injured just 25 steps from the front door of his brother’s shop. This post is the third in a series exploring the details of the murder of a Fredericksburg shopkeeper’s brother, attacked on the night of May 25, 1865, by soldiers of the Army of the Potomac’s Sixth Corps on their way home from war. Part one can be found here, and part two is here. As the court martial trial of James Lynch and William Irvin progressed, Lynch had set up fellow-soldier John Wilson as the man responsible for throwing bricks at shopkeeper Charles Milller and his brother George, fatally injuring George Miller. Wilson had not put up a convincing defense, and both the attacker and the details of that dark night’s events remained clouded in mystery, until the next witness—a source more likely to be overlooked than trusted—took the stand. A turn of the century view of the Liberty Street side of 600 Commerce St., Charles Miller’s shop. Both the Miller brothers and their assailants exited the door at the far right and crossed Liberty Street. The attack occurred just a few yards from this location, down Commerce Street. Two doors opened to Liberty Street from Miller’s shop, and another opened on Commerce Street. As Doctor Galland rose to testify, he must have presented both an unusual figure on the stand and a deep surprise to the soldiers on trial. Galland was an African American camp servant and cook in the employ of accused soldier Amos Fielding, and he stood in the unique position of being able to relate the words and actions of the accused in the immediate aftermath of the incident. Like countless camp servants serving the Army of the Potomac, Galland’s background and future remain a mystery (but will hopefully manifest in enough detail for another post someday),and he held little to no status, perhaps a former slave escaping to freedom as contraband or a free man looking for work. However, as he was sworn in on June 2, 1865, Galland’s story had the power to clear a man’s name and reveal the threads of guilt among the accused soldiers. Through the words of his testimony, we perceive a man who was perhaps not well-educated but was courageous enough to speak of his experiences with clarity and determination. This post is the second in a series on the murder of a Fredericksburg shopkeeper’s brother in May 1865, as the Army of the Potomac’s Sixth Army Corps passed through Fredericksburg on their way home from war. Part one can be found here. After this harrowing experience, Charles made it to the headquarters of Col. Sumner, and they attempted to find the men responsible but were unsuccessful. Charles returned to the shop to find his brother grievously wounded in the head, retrieved by Mr. Louis Kruger, Mr. August Ebert, and the young boy who had been sitting outside the shop. After his brother passed away between 1 and 2 in the morning, it became imperative to find the soldiers who had, intentionally or unintentionally, killed an innocent citizen. Murder in Fredericksburg: A Darkness on Commerce St. It was a dark night. By all accounts, the darkness that fell in Fredericksburg on May 25, 1865 was remarkable, obscuring the events and identities associated with a fateful occurrence. In the streets of “Liberty Town” just west of downtown Fredericksburg, one man said he could only see six steps in front of him. As the church bells tolled 9:00 p.m., 25-year-old August Ebert sat in the darkness beside a “colored boy” on the pavement outside Charles Miller’s store at the corner of Commerce Street (modern William Street) and Liberty Street and watched four Union soldiers enter his sometime employer’s shop. First one pushed open the door and walked inside, then three more arrived soon afterward. The Commerce Street/William Street front of Charles Miller’s shop postwar. Situated on the acutely angled corner of Liberty Street and Commerce Street, Miller’s shop featured two entrance doors–one that opened to each street–here at its front left corner. The building still stands today at 600 William Street. Inside the shop, a typical Thursday night scene played out. Charles Miller’s older brother George had walked in earlier, remarking that if the weather was good, he would plant Charles’ lot the next morning. Mr. Louis Kruger, a Baltimore resident who helped Charles mind the shop, walked into the store proper from a next door room just after the soldiers entered. Charles attended the soldiers who quietly gathered in the store. The first man asked for a quart of cherries; the three who joined sat at the counter and ate with him. Another soldier called for a round of cigars, which Charles distributed. When they finished the cherries, a soldier asked for an orange apiece, and Mr. Kruger obliged. The first soldier stated the price for the fare: 50 cents. Charles objected; the price for all the goods was 70 cents. The soldier disagreed. He was only prepared to pay for the cherries and oranges, which totaled to 50 cents, leaving the cigars to his friends’ responsibility. When Charles agreed, it seemed the matter was settled as the soldier reached to pay for the goods. 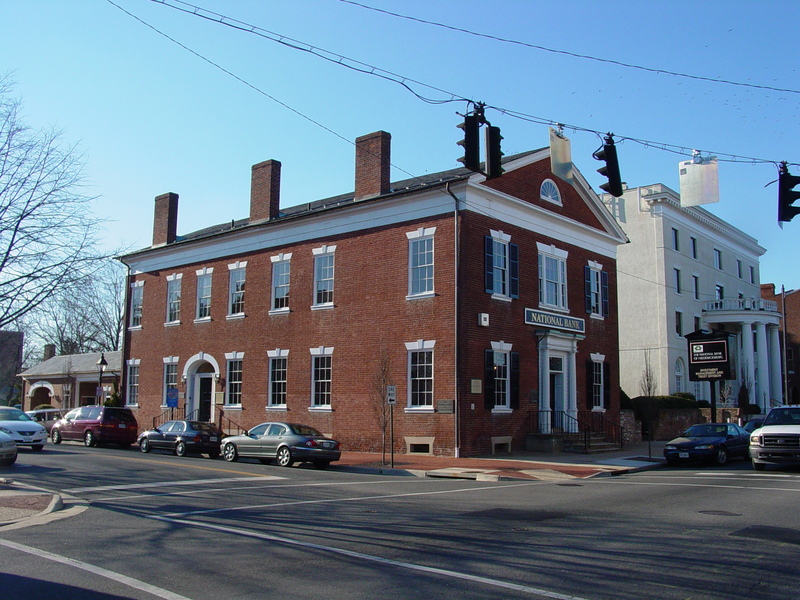 This blog has featured Fredericksburg’s Farmers’ Bank (aka National Bank of Fredericksburg) more than once in its posts (found here and here). Located at the intersection of Princess Anne and George Streets, the structure sits at what was essentially the center of the town. A prominent building, it saw tremendous activity during the war, as occupying Union troops commandeered use of the building as a headquarters and hospital both during and after the Civil War. It is also quite possible that Confederate forces also used the bank, although no sources have come to light pointing to its use by southern soldiers. It should come as no surprise that the marks of war survive on the building. Numerous bricks on both the Princess Anne and George Streets facades of Farmers’ Bank bear the scratching and carvings of vandals. Most of it appears to be of fairly modern origin, but some of the graffiti is without question from the 19th century. Only two are legible enough to be deciphered and attributed to soldiers who passed through Fredericksburg during the Civil War. Both are the work of Confederate privates from Virginia cavalry units. One of the two names carved into a brick is located on the George Street side of the bank, beneath a window to the left of the entrance that historically accessed the residence portion of the building. Is this the most important Civil War-era building in the Fredericksburg region? From Hennessy: Update, February 10, 2015: On November 21, 2014, PNC Bank ceased operations in the former Farmer’s Bank building, bringing its continuous use as a bank to a close after 194 years. The building is now on the market. From Hennessy: Update: On July 31, 2014, PNC Bank announced that the former National Bank Building on Princess Anne Street was up for sale, bringing its continuous use as a bank since 1820 into question (certainly no building in town has been subject to the same commercial use for as long). This post, done originally in 2011, seems pertinent anew, so we post it again. I spent the day today with a National Geographic film crew and the great-great-grandaughter and g-g-great grandson of John Washington, retracing with them the Fredericksburg world of John Washington, a slave who came of age in the years before the Civil War, and who left behind an astonishingly good memoir. We spent a fair amount of time at the Farmer’s Bank Building at the corner of Princess Anne and George Streets. The experience–profound in many ways–got me wondering whether or not we were standing before the most important Civil War-era building in the Fredericksburg region. Some, like Chatham and Brompton, are surely more famous. But for association with important events, people, and themes of American history, is there anyplace hereabouts with greater association with famous people, events, and major themes of American history than this? 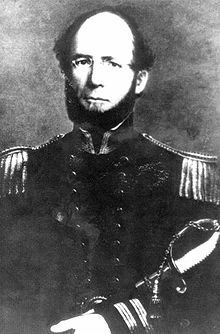 William Lewis Herndon, commander of the doomed steamer Central America, spent part of his childhood living in the Bank building. Herndon, VA, is named in his honor.